Are you having difficulty finding the right dentist for you? Are you upset by a previous terrible experience? Are you confused and don't know who to trust? Or are you terrified of dental treatment and don't know what to do? If your answers to these questions are mainly yes, then There IS No Perfect Dentist is here to help change your smile, your oral health and maybe even your life for the better. For the very first time, the insider knowledge is revealed, making your quest for the perfect dentist so much easier. Whether looking for cosmetic dentistry or simply great general dentistry, There IS No Perfect Dentist gives you the knowledge to help you confidently make some of life's most important decisions, such as: How would I like to smile? What do I do to improve my dental health? Where is the best place to go and who is the right dentist for me? Dr. Neil Gerrard, BDS, RDT, has committed much of his career of twenty-four years to the science and art of implant and cosmetic dentistry. In 2008, his dedication to dental excellence earned him the recognition he deserved and he is now an accredited member and examiner with the British Academy of Cosmetic Dentistry (BACD) – an honour few practitioners have achieved to date. Dr. Gerrard is at the pinnacle of modern dentistry in the UK, giving his patients the very best that dentistry can provide, while enthusiastically sharing his knowledge with fellow professionals through the work of the BACD. 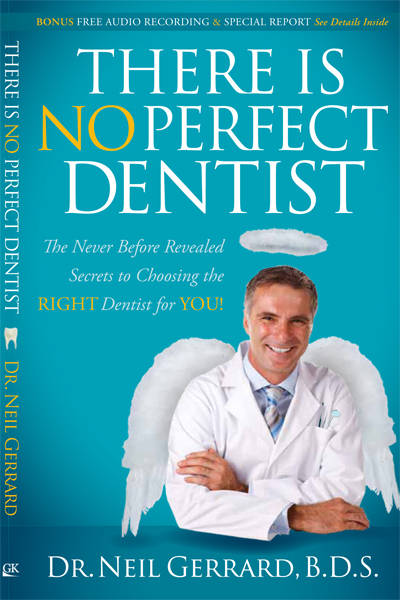 Buy 'There is No Perfect Dentist' from Amazon today.